Toronto Maple Leafs forward Nazem Kadri has been suspended during the Stanley Cup playoffs for the second straight year. This time it will cost him at least the rest of the Leafs’ first-round series against the Boston Bruins. 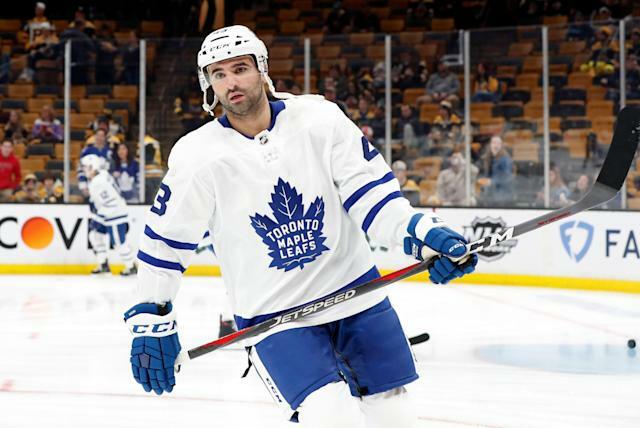 Kadri was handed a ban for the remainder of the opening series for his cross-check on Bruins forward Jake DeBrusk in the third period of Toronto’s Game 2 loss Saturday. DeBrusk had just thrown a questionable hit on Leafs veteran Patrick Marleau, and Kadri decided to retaliate with a cross-check to DeBrusk’s head. The 28-year-old Kadri was immediately ejected from the game and assessed a five-minute major on the play. Boston scored on the ensuing power play, which put the finishing touches on a 4-1 victory to even the series as it shifts back to Toronto. This marks the fifth time Kadri has been suspended over his career, and comes almost exactly one year after he missed three games of last season’s playoff series against the same Bruins for an illegal hit on Tommy Wingels. Leafs head coach Mike Babcock will now need to get creative as he searches for Kadri’s replacement on Toronto’s third line. Kadri scored 16 goals and added 28 assists in 73 regular-season games for the Leafs in 2018-19. He tallied Toronto’s lone goal in Game 2 before he received his game misconduct. Game 3 takes place at Scotiabank Arena at 7:00 p.m. ET.